What started out as an idea for volunteer groups with an interest in heritage or history to showcase their activities has turned into a ‘Waihi Volunteers Event’ according to Roger Pearce, chairperson of Waihi Heritage Vision. 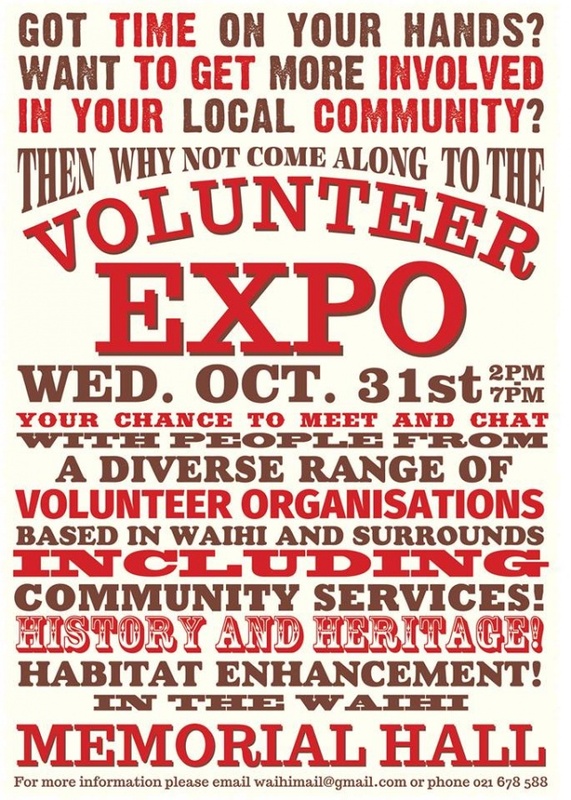 The ‘Volunteer Day’ will run from 2.00pm to 7.00pm on Wednesday 31 October in the Waihi Memorial Hall. “So far we have nine groups which have indicated they will attend the ‘Volunteer Day’ and we have room for more. Battery and Tramway Society, Waihi Museum & Arts Centre, St John, Grey Power, Waihi Community Forum, Waihi Lions and Waihi Heritage Vision. By 31 October Waihi Memorial Hall will be themed for Armistice Day centennial commemorations, organised by Waihi Heritage Vision members. It is also the 60th anniversary of the building of the hall. “Sixty years ago, the community came together to build the Memorial Hall. It has been used by the community since then for an incredibly wide range of activities. assistance or to be part of.